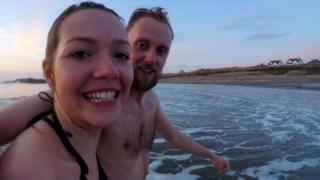 A migraine sufferer who started taking a regular dip in the cold sea to see if it would help ease symptoms is due to complete her 100 day challenge. Beth Francis from Anglesey has seen her migraines reduce from 25 to 15 a month since her personal crusade started. She is not sure if exercise, being outdoors or swimming has helped. But she has vowed to continue and has invited others to join her and partner Andrew Clark for their 100th swim at Llanddona Beach on Sunday at 13:00 BST. A spokeswoman for Migraine Action, an advisory and support charity for people affected by the condition, said there was anecdotal evidence that exercise as well as cold showers can help some sufferers, although exercise could also be a trigger for others. 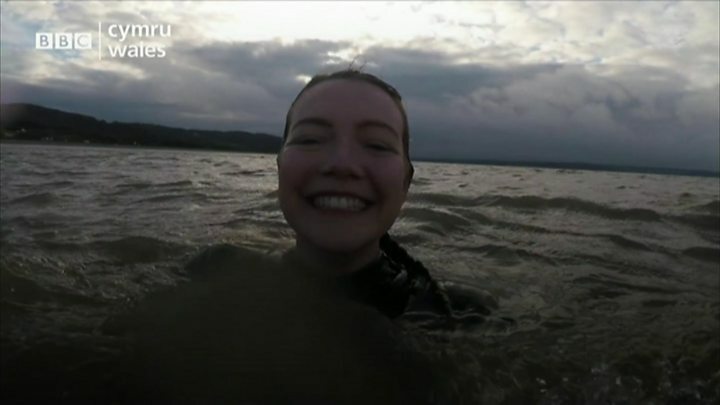 Marine biologist Beth, 27, believes swimming in the sea has helped and she also found getting in the water soon after her symptoms started helped to reduce their severity, although she continues to take medication and to see a specialist. In 2017, the chronic migraines became so severe that Beth, who has been a sufferer since the age of nine, had to take sick leave from her first year of a PhD in marine biology at Bangor University. She admits to becoming "desperate" with symptoms including tinnitus, nausea, stomach aches and feeling numb on one side. Migraine is very common - it affects one in seven British people - and can be hard to stop. So Beth started regularly taking the plunge in the sea off Anglesey after reading research that "the sea can be used as motivation to exercise outdoors to influence health and wellbeing". And she and filmmaker Andrew, 29, started publishing their experiences on social media, under the name 100 Days of Vitamin Sea. Their quest for a cure for Beth also saw the pair sharing their experiences on the BBC Breakfast TV sofa. The project earned them an international accolade for patient-led action as well as support from other sufferers, some of whom are due to join their 100th swim at the same place were they first swam in October 2017. "It seems to have touched a lot of people," said Beth. "It has been an amazing journey." She said a university research project was being set up, looking for participants to take cold showers rather than a dip in the sea to see if it helped with their migraines. "If it is working for her, then that is very positive," she said. "Migraine is an utterly miserable condition."